April’s Nature News was written by Sarah Edwards, who completed her internship at Connecting Country, and Bev Phillips from Maldon Urban Landcare Group. This story featured in the Midland Express on 10 April 2018. If you want to explore some of the ‘living treasures’ featured in this month’s Nature News, Bev Phillips is leading a walk for a Maldon Focus Quarterly Conversation on Saturday 5 May at 1.30 pm. See here for more information. Red Box at St Brigid’s Catholic Church Maldon. 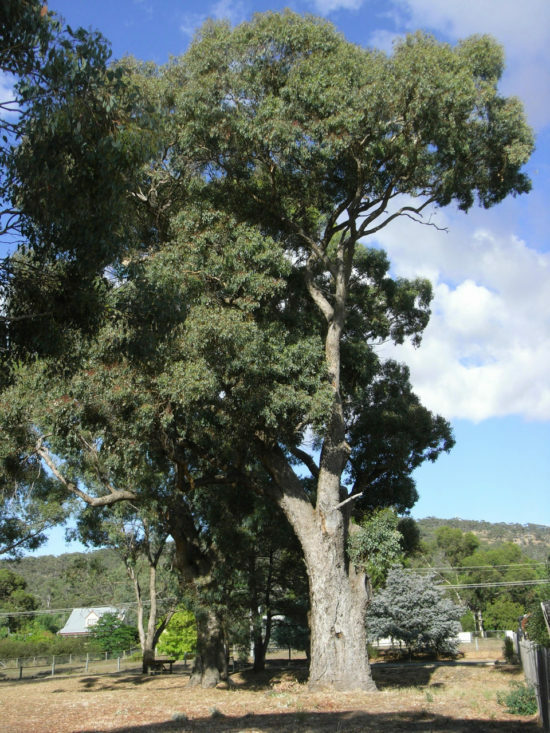 This story began in 2010, when the late Wendy French from Maldon Urban Landcare Group (MULGA) noticed some large pre-European settlement indigenous eucalypt trees located within Maldon, and was very interested in discovering how old they were. Wendy studied approximately 20 trees in town and estimated their age. Six years later, MULGA continued the work Wendy had started. Firstly, there was an original Red Box tree, estimated at 295 years of age, at an intersection that was being re-designed. Then there was a planning proposal for a retirement village to be developed on the site of a Maldon church, where there were four eucalypts estimated as between 185-430 years old. MULGA wanted protection of the trees during construction, and for an existing Petanque piste to not be moved close to the area the four trees. These issues re-ignited the notion of protecting old indigenous trees, as MULGA discovered the trees were not listed or protected under the heritage overlay. In 2017, MULGA members organised a field day to search for all indigenous eucalypts in Maldon that could be classified as being over 165 years old, hence existing before European settlement in 1852. With the help of Frances Cincotta, from Newstead Natives, MULGA members identified, photographed and recorded GPS coordinates for the trees, and used standardised measurements and published growth rates to estimate their age. They identified 61 likely pre-1852 eucalypts, including Grey, Yellow, Red and Long-leaved Box species on private and public land in Maldon. The oldest tree was estimated at 530 years old, and 80% were estimated at over 200 years old. In addition, 36 pre-1852 trees were surveyed on parts of the Maldon Historic Reserve. These trees were estimated to be between 190 and 645 years old. Somehow, the 97 eucalypts managed to survive throughout the gold rush and population boom of the area. They are historically significant as well as being important to the ecosystem in Maldon. If only trees could talk, imagine the stories they could tell! This is an ongoing project. Although the eucalypts surveyed on the Maldon Historic Reserve are under the protection of Parks Victoria, there is currently no protection overlay for the 61 eucalypts surveyed in other areas of Maldon. The protection of these trees is essential to preserve the natural environment and the heritage of Maldon. MULGA will continue to work with Mount Alexander Shire Council to achieve this.